Will connect to the PIC controller and receive its settings and version information. Specify the delay in minutes before the transmitter becomes active. A value of 0 will initiate transmitting as soon as the SYNC switch on the controller is released. The maximum delay is 255 minutes, the default delay is 0 minutes. In Continious and Sequential mode the SYNC may be hardwired to ground. Specifies the time in minutes the transmitter will be active If this value is 0 the transmitter will be active until switched off. Any other value restricts the maximum time the transmitter will be active. The shutdown timing will only start after the Startup Delay has expired. If no recovery delay is specified all activities are stopped and the current drawn is approximately 300 uA. If a non-zero value is specified the transmitter will become active again after the entered number of minutes. Recovery transmission consists of short 500 milliseconds bursts spaced with 1000 millisecond pauzes. This will enlarge the battery life. Continious transmission indicates that the transmitter will start transmitting as soon as the Startup Delay has expired. The transmitter will stay active until the Auto Shutdown is reached. Cycled transmission will start scheduling the number of transmitters. A cycle consists of the Number of transmitters times the Step Length. Each transmitter will be active during the Step Length time if its Cycle ID matches the current step. If the Step Lenght is set to 60 seconds, the nr of transmitters to 3 then the transmitter with ID 1 will be active in the first minute, the transmitter with ID 2 in the second minute and the transmitter with ID 3 in the third minute. After 3 minutes this cycle will repeats itself indefinitly or until the Auto Shutdown time is reached. This mode is according to the international ARDF rules. The Step Length is specified in multiples of 10 seconds. The number of transmitters used in the hunt, ranges from 1 to 10. This value is only used in Cycled Transmission. Indicates on which step in the cycling over the Nr of Transmitters the transmitter will become active. With 5 transmitters these are numbered from 1 to 5. Set the time of each step in cycled mode. The transmitter is active during this time. The minimum time is 10 seconds, the maximum 2550 seconde or more than 30 minutes. 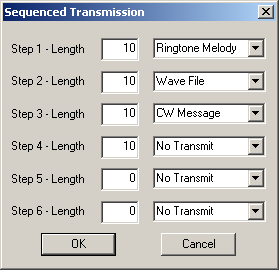 In sequenced transmission you specify the on/off times of the transmitter in 10 second units. For each step the modulation type can also be selected. So it is possible to transmit a CW id every 5 minutes. If this option is selected the transmitter is modulated with a single frequency during the active periods. The frequency can be selected between 50and 3000 Hz. The modulation is done with a sinus. A CW message is generated with an audio tone when the transmitter is active. The frequency is equal to the value selected with the Single Tone option. If Auto-ID is checked the transmitter will generate an MO sequence in continous mode and MOE, MOI, MOS, MOH, MO5 in cycles mode. The proper message is derived from the cycle ID of the transmitter. If the Keyed checkbox is checked the PTT-line of the controller is switched together with the modulation (useful for 80M CW fox transmitters), if the Keyed checbox is left unchecked the PTT-line will remain high during the active period (use this e.g. 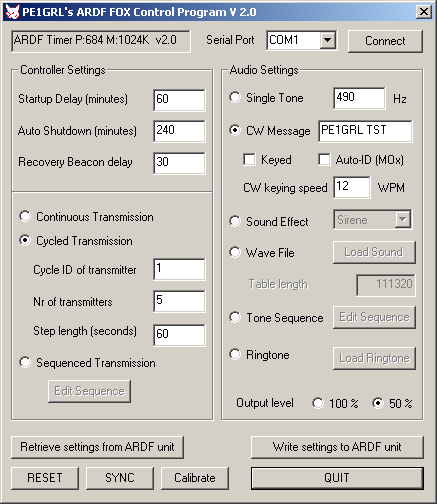 for FM- or AM-transmitters with AFSK modulation). To allow playback of .WAV files the memory option should be installed on the controller (IC3). The maximum duration is limited by the memorysize. A 24C256 will hold up to 4.2 seconds of sound, a 24C512 up to 8.4 seconds. This option is disabled if no memory is detected on the controller. To load a new sound sample into the timer/controller use the button Load Sound. 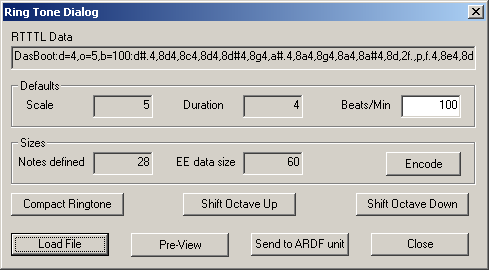 The wave file should be a .WAV file with the format: 8-bit, MONO, 11.025 kHz samplerate. If the wavefile does not fit in the memory a warning message is displayed and the sound sample is truncated. To insert a period with no modulation specify a frequency of 0 Hz.